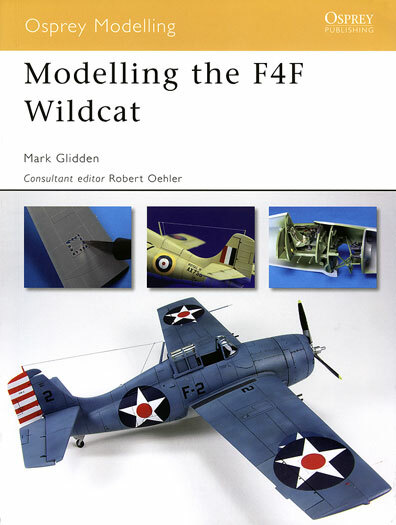 "Modelling the F4F Wildcat" by Mark Glidden is the latest title in Osprey Publishing’s ever growing Modelling Series. As the title suggests, the book features the stubby single-engine monoplane fighter aircraft designed by the Grumman Aircraft Engineering Corporation and produced by both them and the Eastern Aircraft Division of General Motors. Osprey seems to be experimenting with the layout of their Modelling Series books of late and this one, too, is unique from its previously released stablemates in that it features a six-page “walk around” section consisting of 28 colour photographs of two different restored machines – an FM-2 located at the Palm Springs Air Museum and F4F-4 Bureau Number 11828, located at the San Diego Air And Space museum which was recovered from Lake Michigan in 1995 by the U.S. Navy following its crash in 1942 and restored by the museum’s volunteers. We are also treated to four profiles by HyperScale contributor Thierry Dekker that illustrate examples of both U.S. Navy and United States Marine Corps machines. Other than these differences this book provides you with the same basic format of Osprey’s familar Modelling Series. This title includes a series a builds of different kits and scales with the chapters starting from a simple and close to out-of-the-box build and progressing through an easy minor conversion, a more complex conversion and concluding with a complex and difficult one. The Wildcat in Detail. This chapter advises on the designations borne by the Wildcat, the characteristics of each designations and notes on each. Four chapters dealing with the actual builds of individual kits. The previously mentioned walk around. A chapter dealing with different building techniques favoured by the author. A two page chapter providing a listing of available Wildcat kits and accessories in 1/144, 1/72, 1/48 and 1/32 scales. A listing of extant Wildcats and the museums/collections they belong to. A listing of suggested further reading, videos and websites. Also included is a page with 11 paint swatches with explanations as to the use of the various colours. · Desert Cat – Building the Hasegawa 1/72 scale kit as a Martlet III using scratch building skills to overcome the kit’s inadequacies, a True Details resin seat, cockpit set and an Eduard brass photo etch set designed for the kit. 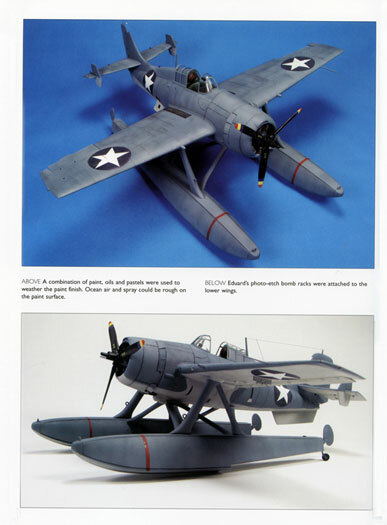 · McKlusky’s Midway Ride - Converting the 1/48 scale Tamiya F4F-4 into the earlier F4F-3. Again, using basic modelling skills for the actual conversion and various resin and photo-etch sets for detailing it. The accessories used include the Eduard phot-etch set for the Tamiya kit, the Ultracast resin seat, Cutting Edge navigation lights, flying control surfaces and gun sight, Quickboost resin .50 cal barrels, elements of the Just Plane Stuff resin conversion, Superscale, and Yellow Wings decals and Eduard and Tally Ho paint masks. · Mixed Breed Cat – Using Tamiya’s 1/48 scale F4F-4 kit to improve the 1/48 scale Sword FM-2 kit. Basic modelling skills combined with aftermarket resin/photo-etch sets to provide detailing. The aftermarket sets used in this chapter include an Ultracast resin seat, Cutting Edge gun sight and propeller, KMC engine, Eduard canopy masking set with the markings coming from Techmod, Mike Grant (instrument dial faces) and Archers Fine Transfers for the cockpit placards. · A Cat Takes to Water – Converting the Tamiya F4F-4 to the F4F-3S Wildcatfish. Not for the feint hearted! Basic modelling skills and various resin/photo-etch sets combined to produce a unique model. The aftermarket sets used include the RVHP Wildcatfish conversion set, Eduard photo-etch set, Aires resin detail set, Cutting Edge gun sight, Montex national insignia masking set and Squadron-Signal vac-formed canopy. Being a fan of WWII aviation and the owner of at least six of the 1/48 scale Tamiya F4F kits I was happy to get my hands this book. I am especially impressed with the Wildcat in Detail chapter as it goes a long way to helping understand the various differences between the Wildcat in both US and British use and enjoyed seeing another modeller’s way of approaching the various builds that I am contemplating myself. The book is well written and profusely illustrated with large, clear, full colour photographs of each build which go a long way in illustrating the author’s written descriptions of each build. The book is comprised of 82 glossy pages measuring 243mm x 185mm between cardboard covers and is well illustrated with 204 colour photographs of both full size Wildcats and the featured models under construction.